How do I manage the fracture of an abutment tooth for a removable partial denture? A patient who has been wearing a removable partial denture (RPD) for quite some time presents with the following chief complaint: "My partial is loose; I think one of the teeth that holds it is broken." It is more common for the last posterior abutment holding a free-end type RPD. The risk of fracture increases if the abutment has been endodontically treated and has a post, since the tooth has been weakened during preparation of the canal. RPD is not retentive or stable. The patient is unable to function properly due the RPD's lack of retention and stability. The patient might experience a foul taste coming from the tooth in question. If the fracture is subcrestal, the patient might experience constant pain with no stimuli or when eating, depending on how long the tooth has been fractured. Intraoral examination: If the fracture is coronal, it will be evident upon visual examination. In other cases, such as fracture at a radicular level, use percussion of the tooth, bite testing and the blue dye stain test. Radiographic examination: A periapical film or a bite wing might help determine the level of fracture. Other factors to assess in the radiograph are crown-to-root ratio, existence of root canal treatment, or a post- and periapical radiolucency. Cone beam CT scan: A cone beam CT scan does not provide conclusive evidence of a root fracture. Drawbacks are cost and radiation exposure to patient. Based on clinical and radiographic examinations, a diagnosis of tooth fracture (at a coronal or a radicular level) can be established. Ask the patient to come early in the morning for an alginate pickup impression and an impression of the opposing arch. It will go to the laboratory with a prescription indicating to add the tooth to be extracted and a clasp (usually wrought wire). The patient can return in the afternoon for extraction and delivery of the repaired RPD. Usually this will fix the problem. The RPD will continue to have good stability and retention. Prepare tooth for a crown. If the patient has had a root canal, a post/core might be needed for retention. Make sure it has ferrule effect; otherwise, crown lengthening is strongly advised. Advise the patient of the limitations of a root canal-treated abutment. Fabricate surveyed crown to fit the existing RPD using a direct or indirect technique. Make a provisional crown to fit on the RPD. Ask the patient to come early in the morning for an alginate pickup impression and an impression of the opposing tooth. It will go to the laboratory with a prescription indicating to add the tooth to be extracted and a clasp (usually wrought wire). The patient can return in the afternoon for extraction and delivery of the repaired RPD. The patient should be informed that retention and stability will not be the same, and a new prosthesis may need to be fabricated. If a restoration is sufficient, proceed and adjust accordingly in order to create a proper height of contour for the claps to engage. If restoring with a full coverage crown, have the patient come in and proceed with tooth preparation; do post/core buildup if needed. Advise the patient that an endodontically treated tooth with a post/core does not offer the best prognosis as a free-end abutment. If the general practitioner does not feel comfortable performing the surgical or restorative phases, refer the patient to a specialist. The patient should be made aware of the procedures that the specialist might suggest: extraction, grafting, implant to replace the tooth or additional teeth, or a new partial denture. If the tooth shows signs of infection, a prescription for antibiotics and possibly pain medications will be needed from the GP. Block MS, Castellon P, Zavala J. Replacement of a fixed partial denture secondary to abutment fracture. J Am Dent Assoc. 2007;138(6):785-90. Chaimattayompol N, Emtiaz S, Woloch MM. Transforming an existing fixed provisional prosthesis into an implant supported fixed provisional prosthesis with the use if healing abutments. J Prosthet Dent. 2002;88(1):96-9. Curtis DA, Plesh O, Sharma A, Finzen F. Complications associated with fixed partial dentures with a loose retainer. J Prosthet Dent. 2006;96(4):245-51. Livaditis GJ. 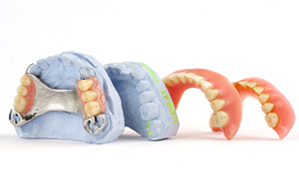 Fabricating abutment crowns for existing removable partial dentures using custom clasp analogs. J Prosthet Dent. 1998;80(5):619-29. Jackson AD, Butler CJ. Fabrication of a new crown and provisional to an existing removable partial denture. J Prosthodont. 1995;4(3):200-4. Juloski J, Radovic I, Goracci C, Vulicevic ZR, Ferrari M. Ferrule effect: A literature review. J Endod. 2012;38(1):11-9. Macpherson JR, Evans DB. Fabricating crowns to fit existing removable partial dentures: an illustration of two techniques. J Prosthodont. 1993;2(3):199-205. Netti CA, Yard RA. Temporization of abutment teeth preparations for existing removable partial dentures. J Prosthet Dent. 1989; 62(4):428-30. Sanal FA, Güler AU, Inan U, Ozdemir OS. Alternative treatment procedure in the case of fractured abutment of adhesive bridge: a clinical report. J Esthet Restor Dent. 2011; 23(2):89-95. Verrett RG, Kaiser DA. Fracture of a fixed partial denture abutment: a clinical report. J Prosthet Dent. 2005; 93(1): 21-3.